Homeopathy for Women – Natural treatments specifically developed for the woman’s body. 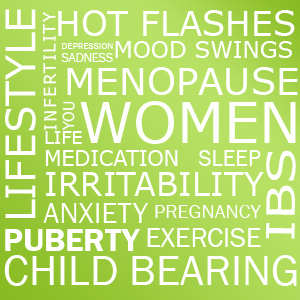 Are you feeling the sometimes overwhelming symptoms of menopause? Are your menstrual cycles and symptoms having a negative impact in your daily life? Are you dealing with infertility? Are you concerned about pregnancy and the post-partum period? These are only a few ailments that only we, as women, might experience in our lifetime. Many women are looking for natural treatments to alleviate the symptoms associated with menopause, menstruation, infertility, urinary incontinence, as well as pregnacy and the post partum period. Homeopathy, which is a natural treatment, is very effective in treating these symptoms. Some women are particularly troubled by symptoms such as hot flashes, dryness or mood swings. It is important to treat the body’s imbalance to alleviate the symptoms from within. Although menopause, pregnancy and menstruation are not illnesses, the symptoms associated with them are often classified as a disease and treated as such in conventional medicine. Christina Richmond, a Certified Classical Homeopath with a focus on Homeopathy for Women, can help women as they go through the different stages of life. As women, we experience body changes that our male counterparts do not. Child bearing poses a heavy burden on the body. Even for women who don’t have children, the changes the body endures to prepare for such occasion can bring a woman easily out of balance. Infertility and or difficulty to conceive is a problem more common than what we would hope. But sometimes, difficulty to conceive can be brought on by our own body’s inability to find balance. Stress in our lives, insecurities, other physical problems can contribute to a lack of balance in our body, and therefore make it more difficult to conceive. As a woman homeopath, Christina will listen to clues about your lifestyle, other ailments, outside circumstances, and other factors that related, can add to the body’s inability or unwillingness to prepare for conception. From infertility, to pregnancy and menopause, remedies can be made specifically for the needs of women as we go through the stages of life. Then there is menopause and the menopause stages. Many women, who experience the sometimes difficult symptoms of menopause cannot alleviate them with western medicine. Homeopatic remedies for women are gently and can assist and even fill the void where traditional medicine could not. Our homeopathic remedies for women are personalized. We focus on the person and her whole body and we listen for signs of unbalance emotionally, physically and, or mentally to ensure the remedies we provide will help her find relief from within. From the common symptoms of hot flashes, headaches and irritability, to vaginal dryness, depression and anxiety, homeopathic remedies for women can help. Menopause – unavoidable stage in the life cycle of all women. Homeopathy will gently assist a woman in menopause with any of those unpleasant symptoms and bring her to a balanced physical, mental and emotional state.